In conventional widefield optical microscopy the specimen is bathed in the light used to excite fluorophores (Figure 1a). The fluorescence emitted by the specimen outside the focal plane of the objective interferes with the resolution of in focus features. As the sample increases in thickness, the ability to capture fine detail above out-of-focus signal becomes increasingly challenging. The confocal principle rejects out-of-focus light through the use of a pinhole, with the added benefit of an improvement in lateral and axial resolution. It is these benefits that make confocal microscopy so popular and why you find one in most core imaging facilities. As can be seen in Figure 2 (inset), only light (denoted by green) from the right plane passes through the pinhole. Light from the plane above the imaged plane (denoted in red) is focussed above the pinhole so most of the light fails to pass through the pinhole. Conversely light from the plane below the imaged plane (denoted in yellow) focuses before the pinhole and fails to pass through the pinhole. Therefore only light from one plane is in focus to pass through the pinhole or as the name suggest 'confocal'. A similar principal applies to a pinhole camera which uses a pinhole to obtain crisp images without a lens. Confocal microscopy is now a routinely used optical technique across a wide range of biological sciences, from plant science to mammalian models. Its use is popular because it has several benefits over conventional widefield microscopy, namely in its ability to remove out-of-focus signal, capture information from a reduced depth of focus, image discreet optical sections in thick samples and so create high contrast 3D image sets. The most common confocal technology is that of confocal laser scanning microscopy (CLSM). In this format the sample is illuminated by a single point of light from a laser (Figure 1b). The laser beam is scanned point by point in a raster pattern and signal is detected sequentially from each point by a photomultiplier tube until an entire image is created. With CLSM, there is a trade-off between image resolution and speed. If the array consists of a 512x512 pixel array and each point is illuminated for 1 microsecond, then each scan will take about 262 milliseconds. The signal from each point must be acquired in that 1 µs and there is time 'skew' of 0.26 second between the first and last points in the scan. To compensate for the brief illumination of each pixel, an intense laser beam is required, and if the specimen is dynamic the time skew can lead to errors in observation. Figure 1. Schematic diagram illustrating the pattern of illumination for conventional widefield, laser scanning, and spinning disk microscopy. In widefield microscopy (a) the sample is broadly illuminated with excitation light with limited focus of its energy dictated through the numerical aperture and focal depth of the objective. 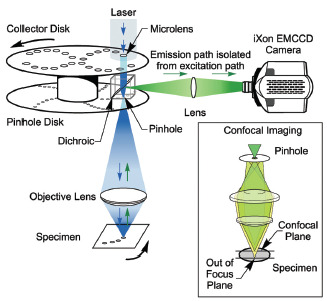 Laser scanning confocal microscopy (b) focuses a single point of laser light through a small aperture (pinhole) and scans sequentially across the sample point by point. Spinning disk confocal microscopy (c) illuminates the sample with a rotating pattern of 1,000's of pinholes for complete simultaneous confocal illumination. Spinning disk confocal laser microscopy (SDCLM) overcomes this problem by exploiting the multiplex principle. Figure 1c illustrates how the sample is illuminated, and so light detected, at multiple points simultaneously. This was originally proven by Felgett in spectroscopy and shows that using parallel detection delivers enhanced sensitivity. A publication by Wang provides a quantitative comparison of point and disk scanning systems for imaging live-cell specimens. Figure 2. Dual disk arrangement of the Yokogawa CSU-X. In addition to the fundamental disk containing an array of pinholes there is a second collector disk with a matching pattern of microlenses. The microlenses focus the excitation light with greater efficiency onto the imaging pinholes so increasing excitation throughput from a limited ~2% up to a functional 70%. This technology improvement, in combination with using an electron multiplying CCD detector, results in spinning disk technology being the ideal solution for fast live cell confocal imaging. Figure 2 shows how the dual spinning disk confocal laser scanner operates. Unlike a conventional laser-scanning microscope, where a narrow laser beam sequentially scans the sample, in SDCLM an expanded beam illuminates an array of microlenses arranged on a (collector) disk. Each microlens has an associated pinhole laterally co-aligned on a second (pinhole) disk and axially positioned at the focal plane of the microlenses. The disks are fixed to a common shaft that is driven at high speed by an electric motor. When the disks spin, and the scanner is coupled to a microscope with the pinhole disk located in its primary image plane, an array of focused laser beams scan across the specimen. Yokogawa realised the benefit of this approach and created their CSU spinning disk confocal unit. Andor's Dragonfly Multi-Modal Confocal takes this to the next level by improving the throughput, homogeneity of illumination and pinhole spacing to handle a wider variety of specimens from single molecules, to yeast to 3D model organs (organoids). The pinholes (and microlenses) are arranged in a pattern, which scans a field of view defined by the array aperture size and the microscope objective magnification. The scanning laser beams excite fluorescent labels in the specimen. Fluorescence emission will be most intense where this array is focused - the focal plane. Some fraction of this light will return along the excitation path where it will be preferentially selected by the same 'confocal' pinholes. A dichroic mirror, which reflects emission wavelengths, is located between the two disks. This separates the laser emission from any excitation light reflected or scattered from the microscope optics. The geometry of the emission path results in a confocal fluorescence signal with extremely low background noise. A further limitation in conventional CSLM is the use of photomultiplier tubes (PMTs) whose quantum efficiency (QE, the probability of converting a photon to an electron) is rather low - typically 30-40%. In contrast the SDCLM technique uses a camera as a detector that can have a very high QE; e.g. an iXon+ 897 EMCCD has a peak QE of more than 90%, making it a near-perfect detector. This combination of the dual spinning disk and high QE detector delivers a confocal instrument that can run at high speed and with unequalled signal-tonoise (SNR).